A new report released in 2013 shows that this number has risen to 1-in-50. However, there also seems to be a significant support for the idea that ASD is rising to epidemic proportions, and that anything from changes in how many older couples are having children to various environmental factors may be increasing the rate of ASD incidents. "Now we know there's a host of genetic and environmental factors that are likely involved," says Dr. Susan Hyman, professor of pediatrics at the University of Rochester Medical Center and chair of the American Academy of Pediatrics subcommittee on autism. One possible contributor to autism's rise is that people are having babies later. The chance for gene glitches increases as parents -- especially dads -- age, explains Irva Hertz-Picciotto, an environmental epidemiologist at the MIND Institute at the University of California, Davis. But delayed childbearing explains only a very small fraction of the rise in autism rates. Environmental factors may turn many autism genes "on" or "off," says Hyman. "The best studies we have now point to things that babies are exposed to in the womb, when the brain is forming," says Hertz-Picciotto. Living in areas with high levels of air pollution (such as near a freeway), having low levels of folic acid, being overweight or diabetic, and having a high fever during pregnancy all seem to up a woman's risk of having a child with autism. 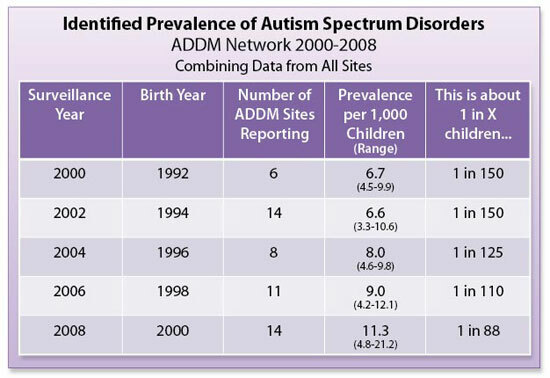 What studies or evidence support an actual increase in the rate of children with ASD? Presumably there are stronger connections to environmental factors than the infamous Wakefield study, given the comments by Dr. Hyman? Are there studies that show a strong correlation with increased rates with changes in the diagnostic criteria, which would support the hypothesis that a significant portion of the increased prevalence is due to improvements in identifying individuals on the spectrum? 25% attributed to diagnostic accretion - particularly children with mental retardation now being concurrently diagnosed with ASD. 15% attributed to improved awareness of ASD. 10% attributed to the increase in the age of mothers choosing to have children. 4% to geographic clustering - that is, families might move to an area where services are available, leading to increased diagnoses in specific areas. This leaves a significant proportion of the increase in ASD identification unexplained, and in need of further investigations.